The above is an editable equation. 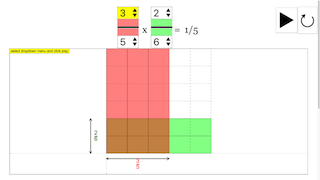 To edit the numerator/denominator, click on the combo boxes. The equation and solution changes. The total numerator is shown as the brown area, while the new denominator as the whole thing. Changing the green denominator as well will affect the results. Notice how the brown area is reduced to 1/6 of it's original size. as compared to shown in the diagram, for better visualization. Simply click the refresh button in your browser.